This device has 3 pins. Ground (G), VCC (V), and Signal (S). The signal wire line is digital. It will either be high or low. High if the detected range is further than the calibrated distance, low if the detected range is less than the calibrated distance. How to use it with the Arduino Power the device by connecting Ground to Ground, VCC to 5v. Connect signal to a digital pin. You’ll then need to set the digital pin to INPUT mode. Read the digital pin. The pin will read high if the detected distance. This device has two potentiometers you can adjust to calibrate the device. One for frequency (F) and one for distance (D). Much like an IR Remote, the IR light is oscillated at a defined frequency and detected at that same frequency; this enables the sensor to work in noisy environments. You can adjust the frequency to avoid interference with other detectors or other IR sources. You can set the distance the sensor is triggered from by adjusting the Distance potentiometer. Notice the LED will light up when it is triggered. Turn this pot clockwise to increase the distance, turn it counter-clockwise to decrease the distance. 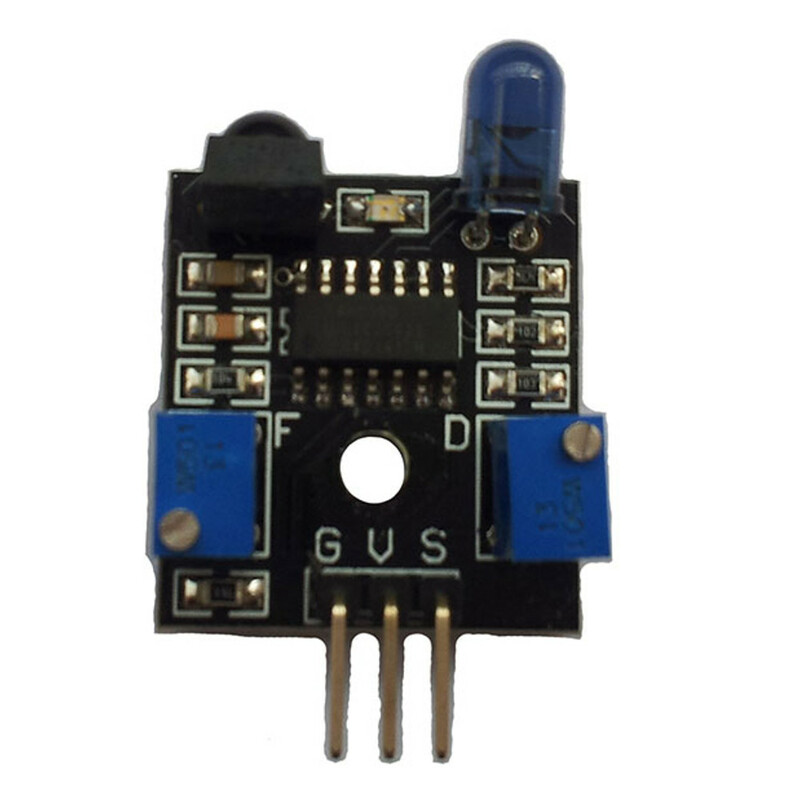 Power the device by connecting Ground to Ground, VCC to 5v. 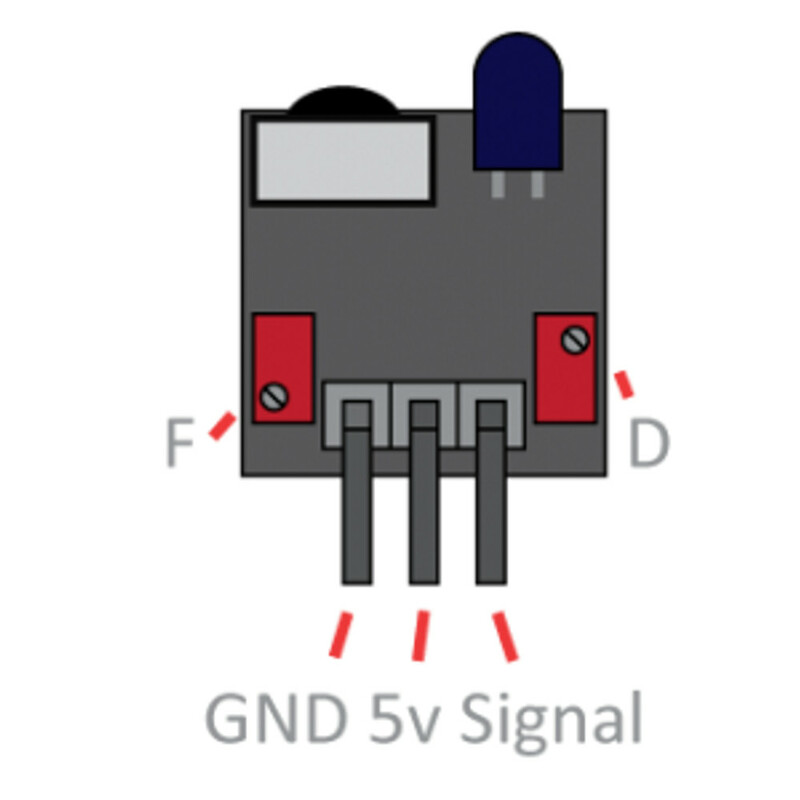 Connect signal to a digital pin. You’ll then need to set the digital pin to INPUT mode. Read the digital pin. The pin will read high if the detected distance.